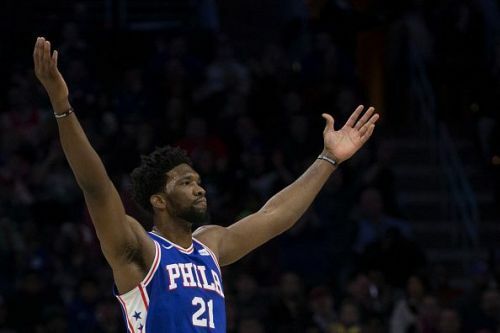 Joel Embiid is among the top 5 contenders for the MVP award this season, and there is no doubt about it. He is averaging 27 points, 13.4 rebounds and two blocks per game in the 25 games played by him. He is ranking second in the league for total points scored, first in total rebounds taken and eighth in blocks per game. He is already putting up massive scorelines and is being compared to the greats of the game. 1) Nobody has averaged 27 points and 13 rebounds per game in the first 25 games of the season since the three-time MVP Moses Malone did it back 1981-82 season. Embiid is already disturbing the history books in his third season for the 76ers. 2) Embiid's performance is, so far, matching the MVP season of Shaquille O'Neal's in 1999-2000 where Shaq averaged 29.7 points, 13.6 rebounds, and 57.4 shooting percentage. 3) Embiid posted 30 points and ten rebounds in the 13 of the first 25 games, which no player in the NBA has done in 35 years. 4) Embiid is grabbing 33.1% of all possible defensive rebounds when he is on the floor, which displays how dominant he can be in the paint. 5) He is taking 14.4 free throw attempts per 100 possessions which the most in the league. Embiid is much more than these stats. He has established himself as one of the best offensive and defensive players in the NBA. He is a significant threat to the other teams and a very viable part of the 76ers lineup. It will be interesting to see if he wins the MVP award this year or not. Some of the other contenders for the MVP award are LeBron James, Kawhi Leonard, Anthony Davis, and Giannis Antetokounmpo. All of them are having great seasons, and in the end, the complete two-way player in the right team will have the maximum chance. Embiid has a very high chance of winning the MVP award if he maintains these stats for the Sixers. For now, he's having a great year and his team rank third in the Eastern Conference.